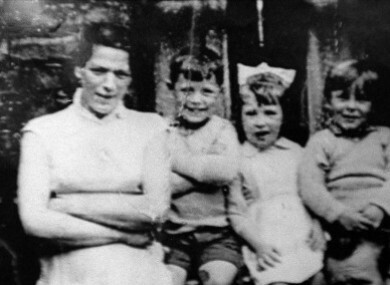 The mother of ten was abducted, tortured and killed by the IRA in 1972. Her body was found in Louth ten years ago today. THE FAMILY OF Jean McConville – the mother-of-ten kidnapped and killed by the IRA in 1972 – have launched a civil action against Chief Constable of the PSNI, Matt Baggott, and the UK Ministry of Defence. The family says there have been severe shortcomings in how authorities dealt with the case. According to solicitor for the McConvilles, Ciarán Mulholland: “The McConville family firmly believe that the RUC and subsequently the PSNI have utterly failed to assist the family’s quest for the truth”. Mulholland said the circumstances of the case are that “our clients’ mother was abducted by the Provisional IRA on 30th November 1972 from a bingo hall in the lower Falls area of Belfast and interrogated on suspicion of being an informant. “We are instructed that Mrs McConville was found by a British Army patrol in the early hours of 1st December 1972 ‘roaming the streets in a state’ and conveyed to Queen Street RUC Barracks. “At approximately 18:00 on 1st December 1972 Mrs McConville was abducted from her home by individuals claiming to be the PIRA. “This was reported to the RUC at Queen Street within hours, however Police refused to assist. It is abundantly clear that Police negligently failed to hold a prompt and efficient investigation into this matter. According to the solicitor “the family now feel that given the lengthy passage of time and the obstruction they continue to meet seeking the truth into the disappearance and murder of their mother that they have no alternative other than to hold the Police and Ministry of Defence to account”. Representations on behalf of the family have been sent to PSNI Chief Constable Matt Baggott and the UK Ministry of Defence. Today is the tenth anniversary of the discovery of Jean McConville’s remains on Shillinghill Beach in Co Louth. Email “Jean McConville family launch civil action against PSNI & MoD”. Feedback on “Jean McConville family launch civil action against PSNI & MoD”.